Since we bought the place, Christy and I have been looking for a wonderful dining room table to use for entertaining and for every day. We like solid, wooden furniture. So it turns out that solidly built, quality furniture is insanely expensive. Here’s a link to see a Restoration Hardware table that we really like. Being the adventurous people that we are, we decided that we would rather not spend thousands of dollars on furniture right now, and instead opted to learn how to build the thing ourselves. 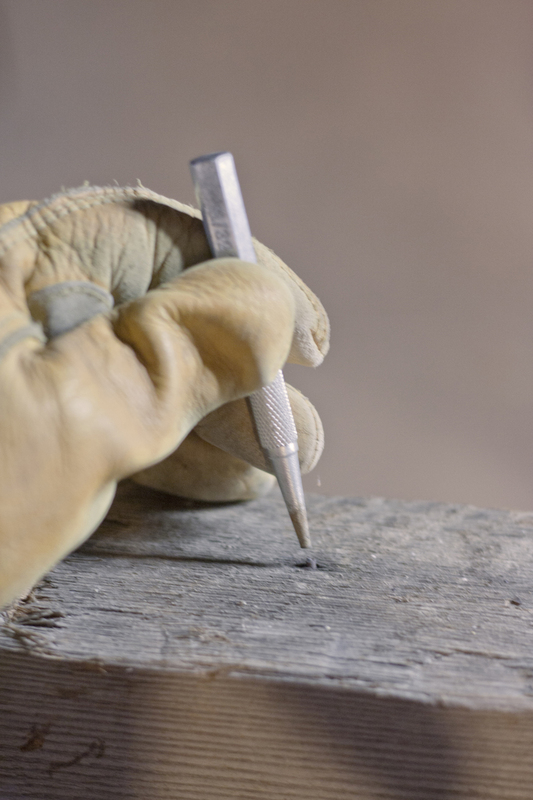 This is actually a rather large undertaking, but with the skills we’ve picked up along the way and a few new tools, we think we can handle it. The first thing we had to do was find materials. Since this thing is supposed to be made out of reclaimed wood, I asked around and my Uncle Bob came through. 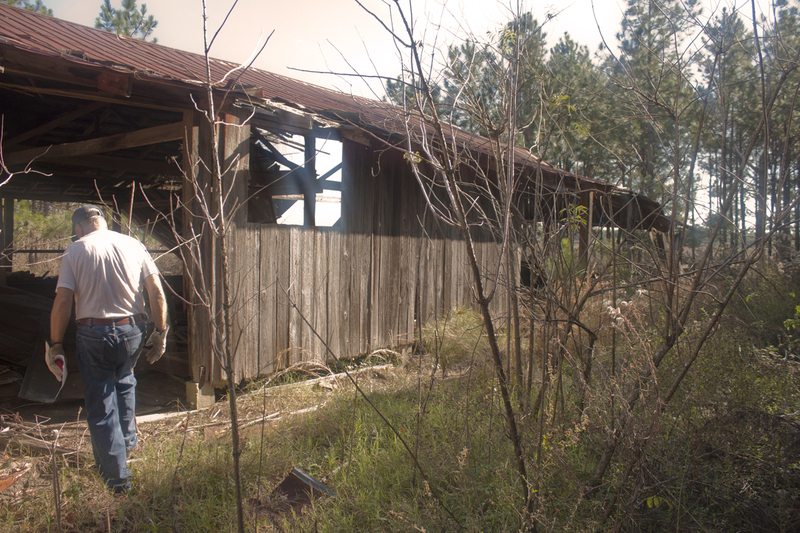 As it turns out, Uncle Bob owns a farm in south Georgia and raized a few farm houses back in the 80’s. 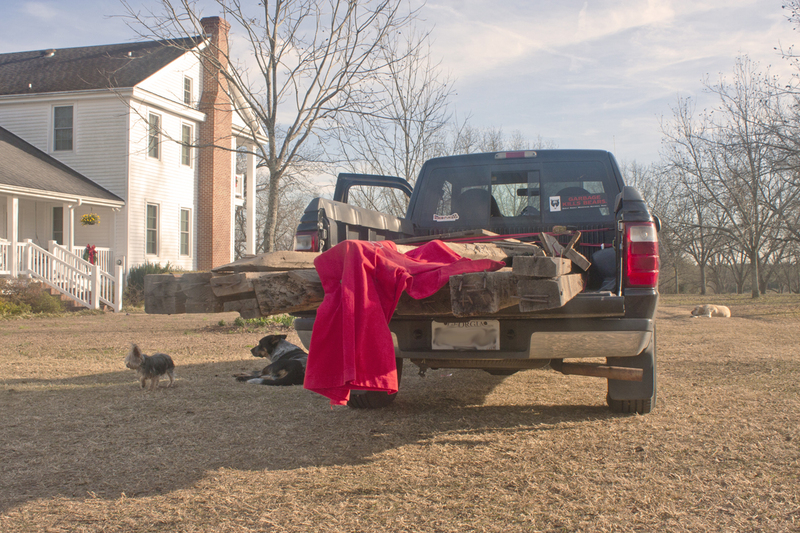 He stacked the timbers from those houses in a barn on his property to use as he needed. 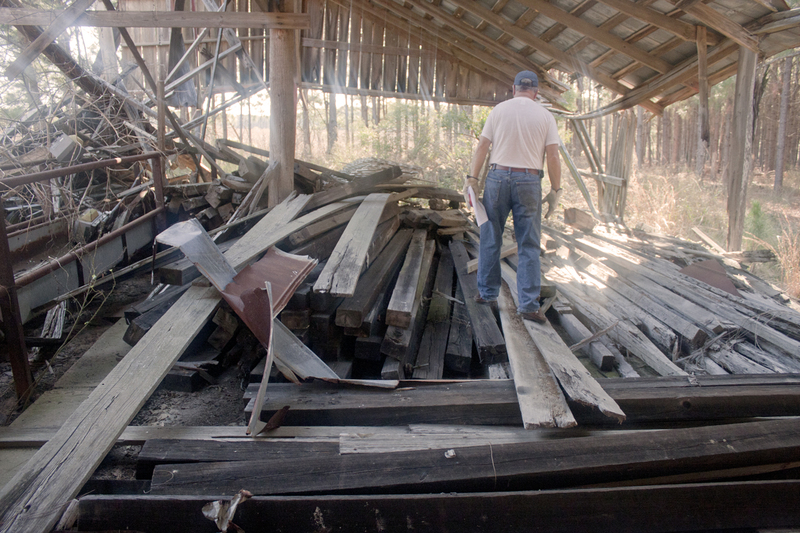 The houses he tore down were built between 1890 and 1910, so the timbers are at least 100 years old. 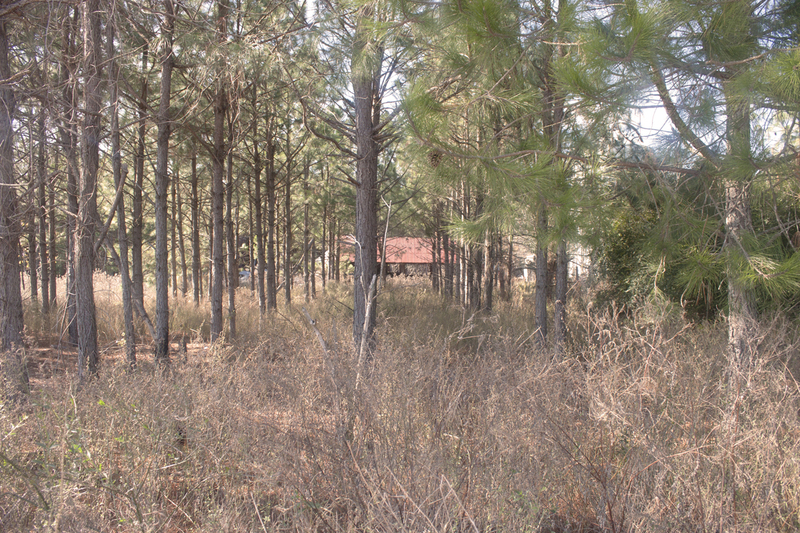 In the photo below, you can see the greying heart pine timbers stacked where Uncle Bob left them 30 years ago. Heart Pine refers to wood taken from the center of very old pine trees from several different species, including loblolly and yellow pine. The important part of that definition is the old part. Today’s pine farmers harvest their trees when they’re 15-30 years old. The heart pine timbers used to build many of the south’s old homes were taken from old growth tress that were 200-300 years old. These trees had heart wood that was extremely dense and made timbers that were heavy and longlasting with a natural resistance to disease and insects. My Uncle Bob refers to the heart pine as fat lighter, another term used to describe heart wood because it is also rich in pine resin when uncured. It’s highly flammable. The photo above shows a slice from two 4×4 beams. 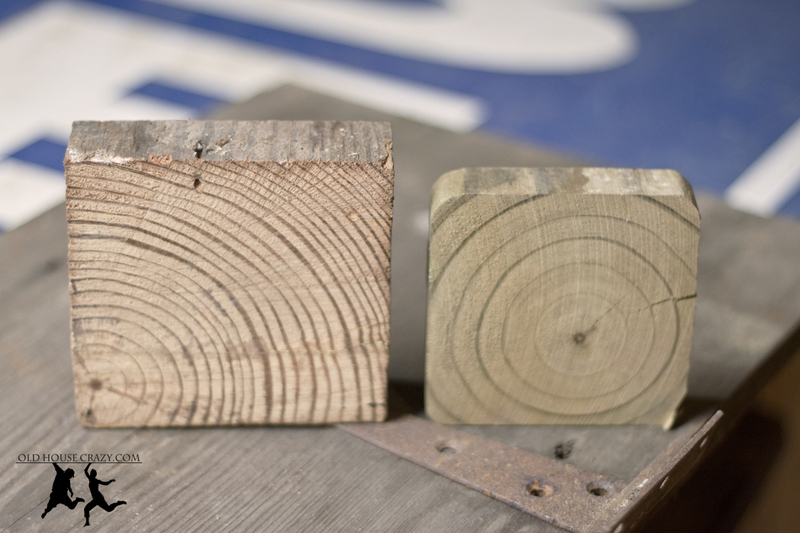 The larger slice is from a heart pine beam from Uncle Bob. The small slice is from a treated pine post left over from building our fence. Both beams are 4×4’s, meaning they should measure 4 inches by 4 inches. Old houses are built from lumber that is true to its dimensions. New building standards have shrunken our timbers. A modern 4×4 is actually smaller than 4″ by 4″. 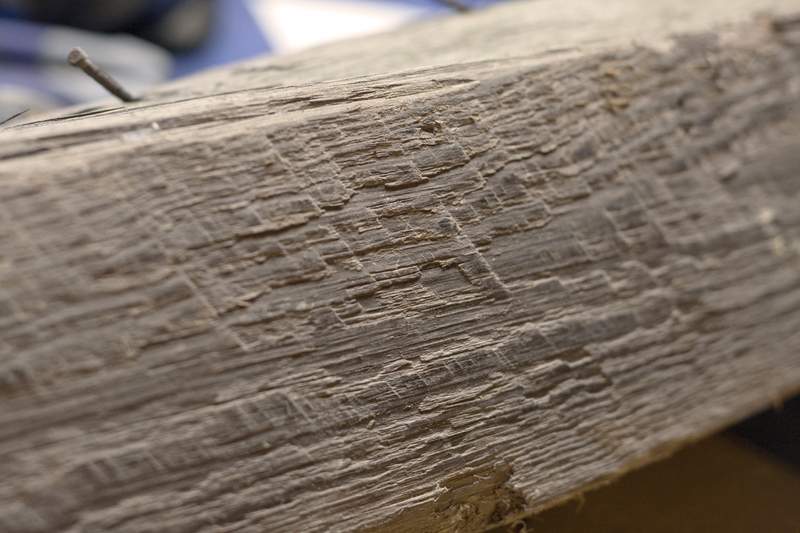 The second thing to notice is the growth rings. You can see the center of each tree as indicated by the small circle. 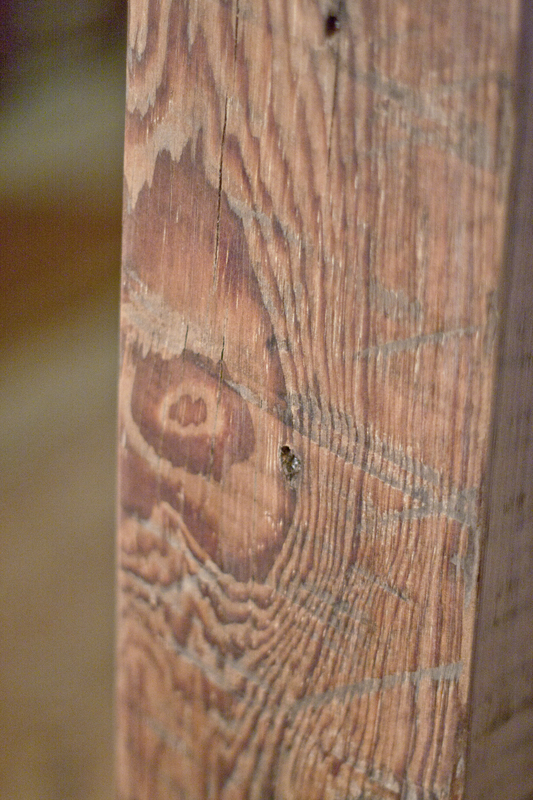 Note how close together the rings are in the heart pine timber. 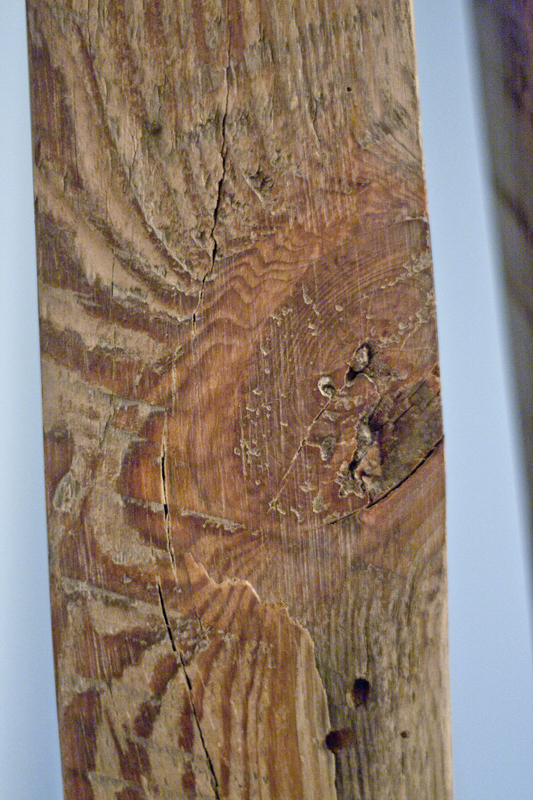 This tree grew slowly and developed over many more years than the newer beam. 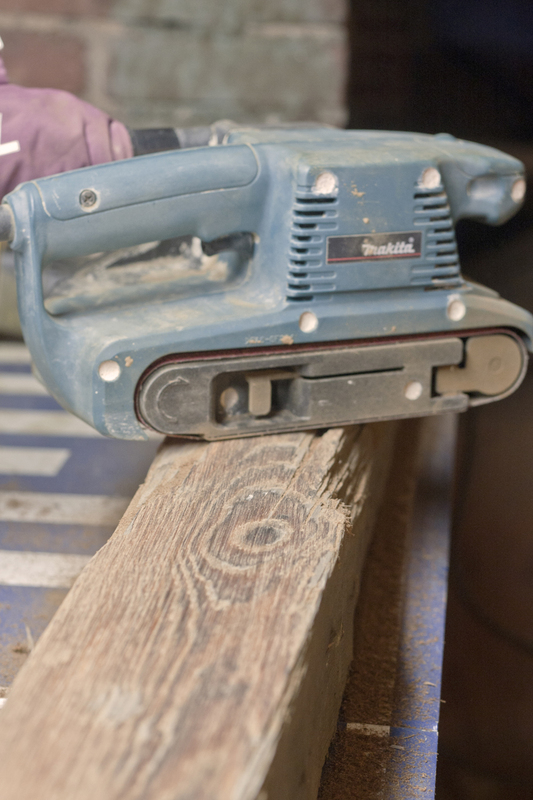 The new wood is much less dense and is the commonly known soft pine that most new homes are built of. You can see in the photos above that the beams were very worn and faded grey. 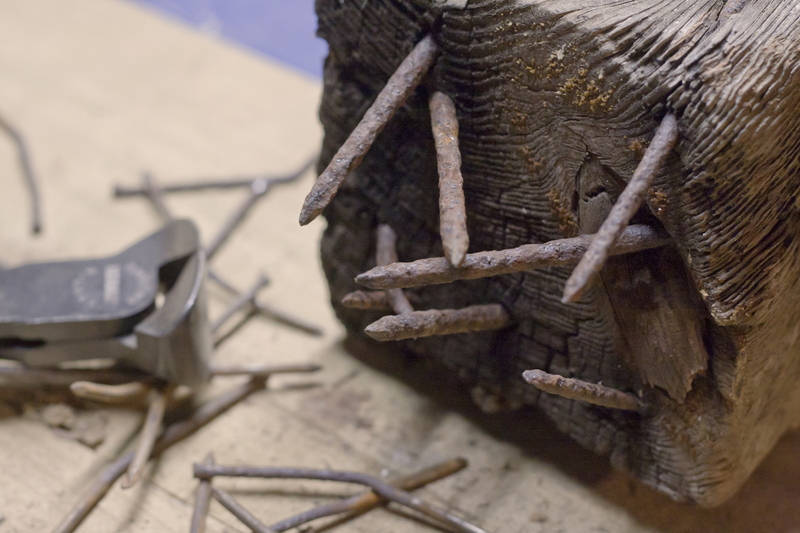 They also still contained the nails used to hold the old houses together. 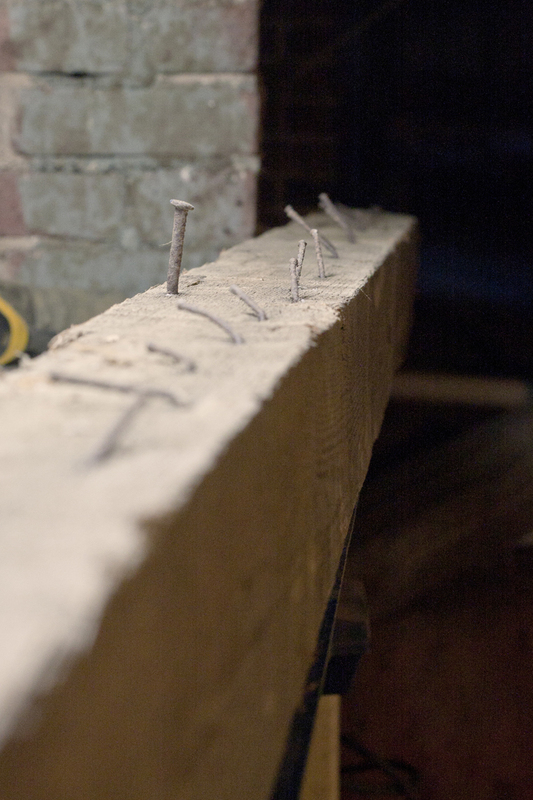 My first major project was to prepare the beams by removing the nails and sanding like a crazy person. I also decided to build a multi-level shelf as a warm-up for the table project. 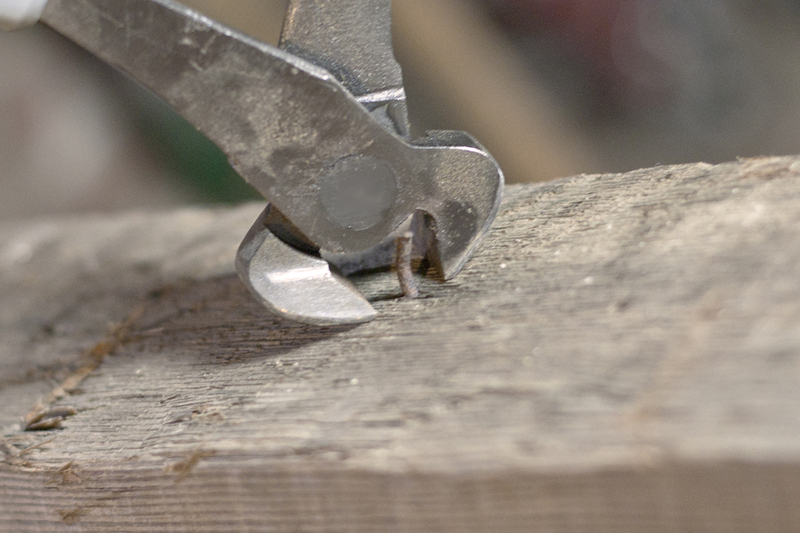 I used a hammer, rubber hammer, nail cutters, pliers, and a nail punch to remove all of the metal or push it far enough into the wood so that it wouldn’t damage my sanders. Then came the sanding. After that I sanded again. Then some more. 32 grit paper with a belt sander. 80 grit with a belt sander. 120 grit with a belt sander. Then 220 grit with an orbit sander. 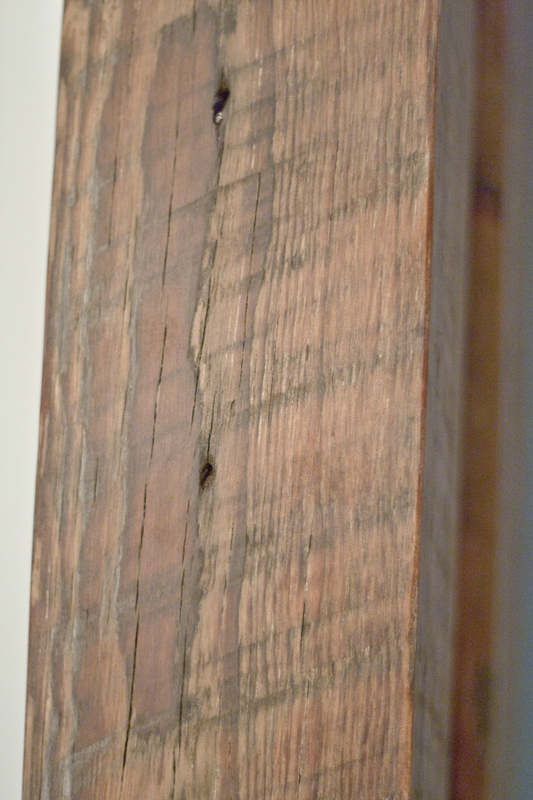 The final products were timbers of a beautiful color with dense wood grain and a whole lot of character. My next post will be about assembling the heart pine shelf using 4×4 timbers and old stairs from under our house as the shelves. Thanks for reading. This entry was posted in Better than store bought, DIY, Furniture, Heart Pine, Home Built, Repurposed. Bookmark the permalink. We have two 100 year old pine shelves that I would like to try and get $85 for them both. Will you be interested in them? My email is tracykj (at) yahoo.com … We have not changed them in anyway, still oranginal, but rustic looking.. I can send you some pictures if you like.